The cards are hand-painted and coloured, some on standard printed cards, artfully incorporating the suit symbols into the images depicting contemporary scenes in late Georgian society. We see folks snoozing by the fireside, smoking pipes, enjoying a musical ensemble, playing card games and a variety of other everyday scenes. In short, a candid documentary glimpse of bourgeois domestic life and manners without pomposity. 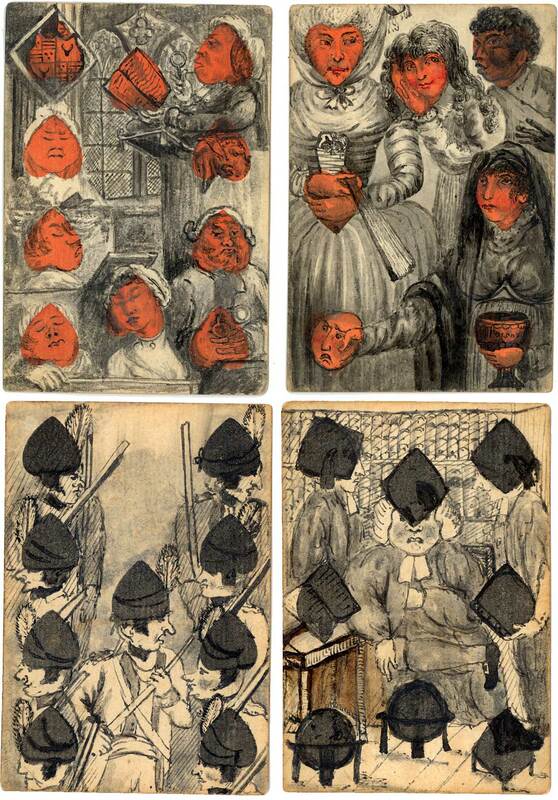 There is a fascinating range of facial expressions and other details to be enjoyed in these very early cards. Some of the drawings are executed in landscape format (above) and the rest are portrait (below). Only numeral cards are present and one of them (four of hearts) has the inscription “MES 1819”. The ace of diamonds is from the same artist. Some of the images are copied from English printed packs but most are original, which supports the theory that drawing transformations on playing cards was originally a Georgian parlour game. Several images also appear to have inspired later transformation packs. 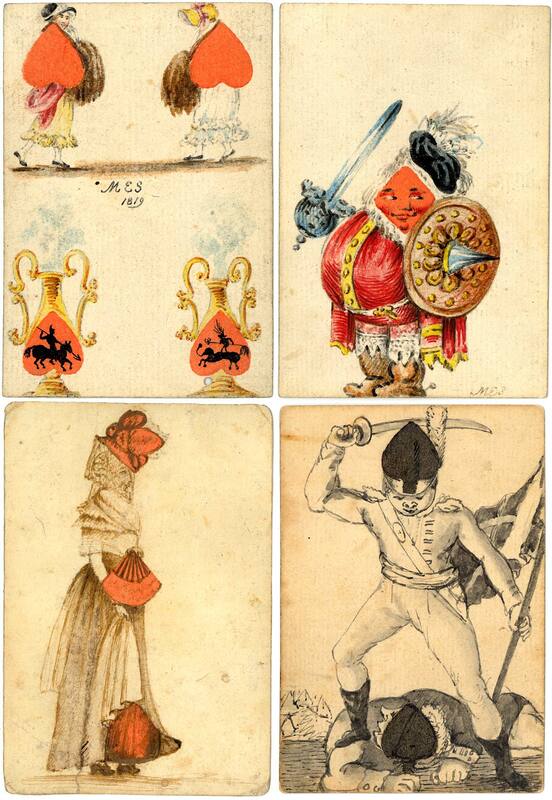 Above: 34 assorted early 19th century hand-painted transformation playing cards, formerly in the Sylvia Mann collection. The cards come from more than one pack and are amongst the earliest hand-painted transformation cards known. The backs are all plain; various measurements. Images courtesy Barney Townshend.